Inspired by William Bunge’s attempts at reimagining cartography as a radical political practice, I will here attempt to outline a cartographic approach to a specific political practice. Planka.nu is a fare-dodgers union organized by the Swedish organization SUF, a syndicalist youth league associated with the syndicalist union SAC, in 2001. The idea spread to Sweden through contact with Italian activists during the “summit hopping” years of the 90’s and early 00’s. Planka.nu organized membership dues into a solidarity fund, which would cover any fines which members incurred while fare dodging. In addition to this, activists from Planka.nu have been extremely prolific, both in terms of demonstrations, a variety of media stunts, and the publication of a great deal of theory and proposals on urban commons and mobility. The organization has, to a large extent, been responsible for the popularization of the term “nolltaxa” (fare-less, free of charge) and the demand for free public transportation. Ten years on, Planka is sufficiently embedded in Swedish popular culture to be referenced in rap songs and be invited to TED talks. The movement has since spread to Norway, Denmark, and Finland. The Stockholm public transport system thoroughly privatized and fragmented. Similar processes are underway in most larger Scandinavian cities. 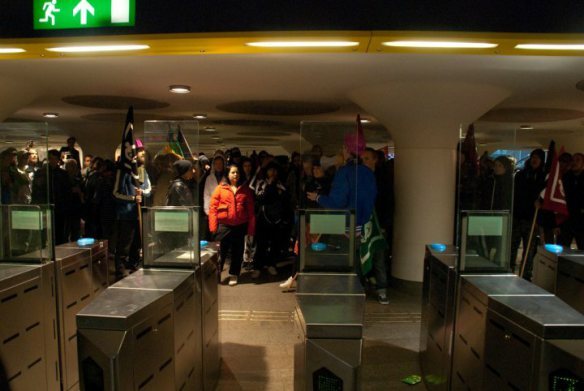 The process of privatization has been accompanied by an increasingly invasive securitization (including recurring incidents of violence by security personnel and police against commuters, as well as injuries caused by the turnstiles themselves) as well as increases in fares. Predictably, the privatization has led to the virtual destruction of the transport workers unions and the increasing use of underpaid, and sometimes-undocumented migrant labor. The transit authorities (though ostensibly still a public service) refer to commuters as “customers” and the areas under its control are treated as private property. The political aims articulated by Planka.nu hover somewhere between social democratic nostalgia and autonomist notions of free appropriation of use value. The name of the solidarity fund is p-kassan, a tongue-in-cheek tribute to the trade unions’ venerable unemployment fund, a-kassan. The demand for free public transport is couched in terms of the commute being part of the working day. Furthermore, the case is made that the spatial segregation of Stockholm (a fairly concentric city with a wealthy centre and poorer periphery) necessitates a social policy on mobility. There are also vague calls for self-management of the transport system by commuters and workers, but this is probably the least developed aspect of Plankas politics. The stated goals of the organization are thus more or less predicated on a kind of welfare state nostalgia. Nevertheless, the demand is actualized by its own formulation; public transport is in a sense already free for Planka members. The demand for free public transportation, while being pragmatic, realistic, and eminently compatible with capitalism, nevertheless retains an air of titillating impossibility. So how is all this an act of mapping? In one sense, Planka presents public transportation as a microcosm of capitalism, one which is experiential in a very direct sense. After joining Planka, (perhaps having read some of the literature, perhaps not) the commuter experiences the space of the transit system as contested ground between opposing interests. In the act of refusing to pay, the commuter is in effect reappropriating this space as common. In refusing to pay as part of an emergent collectivity, the commuter is made aware that an interest in reappropriation of enclosed commons is an interest she shares with others, and one that can be effectuated best by means of mutual aid and solidarity. Furthermore, the defiance of the apparatus of control, which mobilizes an impressive number of cctv cameras, rent-a-cops, and turnstiles to give the impression of omniscience and dominance, is symbolically significant. The ludic propaganda films Planka produces, showing creative turnstile jumping and sometimes direct defiance of security personnel, underscores the point that such dominance is never as total as the image it projects. Thus participation in Planka situates the commuter in a collective antagonistic discourse as well as a physical space where a variety of contending interests clash, in addition to underscoring the weakness of systems of control (at least in relation to the widespread perceptions thereof). To the extent that the goal of a radical cartography is to help the individual situate themselves physically and conceptually in a social framework, I would make the case that by imbuing public spaces with alternative meanings which manifest the social conflict that shapes them. Planka is thus, in addition to direct action, a form of representation. Tadzio Mueller, in his Phd thesis “Other Worlds, Other Values”, argues that Planka takes an act of indeterminate political content, namely fare dodging, and imbues it with radical content. Privatization, fare dodging, and¬ Planka constitute a “battle of flows”. The breakdown of the disciplinary society of the welfare state, predicated on the entente between labor and capital, and the emergence of a new neo-liberal ethos is a shift in flow. The shift engenders various smaller flows which diverge from the shifting flows, such as fare-dodging, shoplifting, file sharing, etc, activities of those for whom the old sense of social responsibility is obsolete but who have not internalized the neo-liberal ethos of paying customers. It is this politically indeterminate flow (Mueller points out that it could just as well be read as the actions of profit-maximizing individuals who balance the risk of being caught with the money saved) which Planka seeks to politicize. It is thus mapping in a second sense; it places a behavior formulated in response to changing conditions in a political discourse. It actively interprets actions; both articulating them and imposing a political agenda on them. In this sense it maps the act of fare-dodging, rather than providing the commuter with an alternative “map” of her social circumstance, as described above. Planka is at this point a natural part of any televised debate on fare dodging (and increasingly, matters of transport as whole), “representing” the interests of fare dodgers. A collective political identity with articulated demands has emerged, where previously there was only amorphous anti-social behaviour. There is a third, and rather more speculative way in which Planka can be an act of mapping. Speculative because I do not currently have the data at hand to support any of the following claims. I bring it up because I feel it is an interesting line of thought, which is not, to my knowledge currently explored by any of the Planka collectives. We could conceptualize Planka as a kind of militant inquiry, not in the workplace, as has traditionally been the case, but in enclosed urban commons. For militants concerned with such matters, Planka membership data provides an index of people who are at any point at odds with the imposition of fares and privatization to the degree that they are prepared to take direct action (whether due to conviction or other contingency). The numbers of people participating could be read as an indication of wider mood in the urban populace towards urban enclosure. Or, if further sociological data (ie age, social background, etc) on participants rendered such a distinction possible, of a certain segment of the urban populace. Furthermore, the activity opens a line of communication between the researcher and, as it where, the subject (although such a distinction is problematic in this context). It puts the researcher in a position far removed from the disinterested observer, but the position as catalyst/lightning rod is one that could undoubtedly yield different insights altogether. The communication between the active core of Planka and its members, supporters, and detractors, in the form of emails, status updates, tweets, etc is one source of material. Another is the authority’s responses to the phenomenon, as these are expressed in interventions in public discourse and attempts at repression. The organization is essentialy in a position to collect and systematize the responses to a situation it has created. In this sense, Planka provides a unique vantage point from which to engage with the wider process of resistance or acquiescence to the process of urban enclosure. It creates (or rather, draws out) conflicts which are not immediately visible in the urban landscape. Its emergence as a focal point for discontent, at a convergence of issues ranging from the right to urban space to the legitimacy of representative democracy, can potentially provide militants with a great deal of insight into the dynamic between people, state, and capital as it plays out in cities. An Introduction to Kämpa tillsammans! Planka provides a unique vantage point from which to engage with the wider process of resistance or acquiescence to the process of urban enclosure. It creates (or rather, draws out) conflicts which are not immediately visible in the urban landscape. I will here attempt to outline a cartographic approach to a specific political practice. Why does the author attempt this? What is the purpose of cartography/mapping here? Is it just an outline of Planka, the context in which they arose, their aims and methods, etc.? hey, I wrote this, it's nice to see it up here, I'm a long time lurker, first time poster. I was active in Planka Oslo up until it was shut down last year.I appreciate it being uploaded, but it would be nice to be contacted beforehand? I would have preferred to revise the text a little if it was going up here. As for the focus, well, I wrote this for a class, the assignment was on social cartography, and I wanted to do a bit on Planka. symbolic coding is (if I got it right, this is a little while ago); a station on the tube is "coded" with turnstiles, security guards, ominous announcements about suspicious behaviour, adverts, etc, which as well as having a clear material function (making sure we pay and behave) tell us its commercial, private space where our behaviour is closely monitored. Mueller also writes about how for example, the solidarity in the social democratic labour movement and the ideology about "the people's home" which was dominant in post-war Scandinavia was inscribed into everyday life, so for instance paying your fare on the tram was (also) a symbolic action that shows you're up for doing your bit in building the people's home and whatnot, while not paying symbolized being anti-social. With privatization that coding begins to fall apart, meaning that people's actions no longer carry the same symbolic significance, and the symbolic significance of not paying is up for grabs. So by organizing it and articulating it as mutual aid, we were kind of hoping to "re-code" it as an act of collective resistance, as well as helping each other out practically in the face of extortionate fares. I'm not very familiar with the original philosophical context of the term (I think it's from Deleuze n Guattari), so I would recommend reading the relevant bits of Mueller's paper (which is really interesting). Maybe Altermark can hyperlink it in the article? Its on Planka.nu.